Digital Financial Inclusion In India – A Long Road To Take-Off? The road to financial inclusion in India has been difficult, but early signs of positive future are appearing as the government continues to create an enabling regulatory and policy environment. 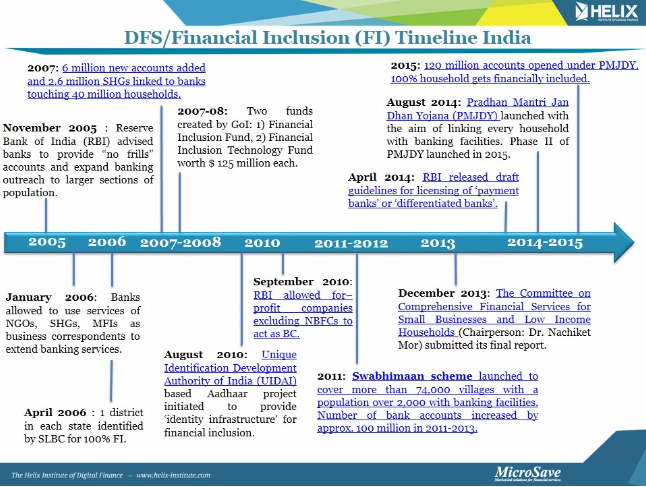 The history of India’s efforts to achieve digital financial inclusion has been diverse, but largely top-down. These efforts have produced a mixture of RBI regulations and advices for banks, and government policies and directives. Most recently, the RBI provided guidelines for differentiated banks (Payments and Small Finance Banks) specifically designed to deepen outreach and enhance financial inclusion. And in August 2015, the RBI issued provisional payments bank licenses to a fascinating array of 11 very different organisations and consortia. However, on occasions, most notably in 2012, the advices and directives have provided conflicting signals, making the road to achieving financial inclusion considerably more fraught than it need have been. Despite this, the number of agents available in India has continued to grow — in both rural and urban areas. 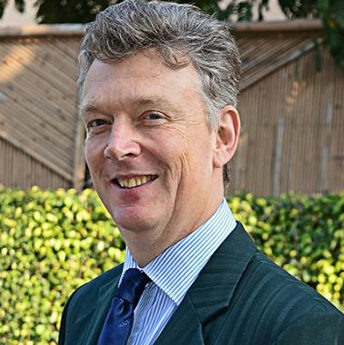 Given India’s sheer size, it is perhaps unsurprising that the number of agent outlets is considerable. Kenya has around 100,000 agent outlets; India (despite its faltering efforts at digital financial inclusion) has nearly six times this number. 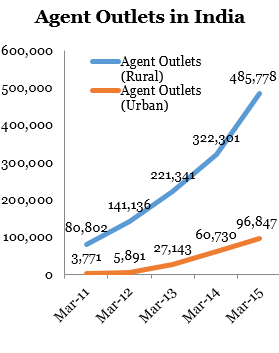 The annual growth rate of Indian urban and rural agent outlets remains in the range of 50%-60%. less than 4% are earning more than Rs. 2,000 a month; with a median monthly income as low as Rs. 1,500, and quite likely to quit the business soon. However, two years later, 54% of the agents were “transaction ready” (and this rose to 79% by mid-2015) and were on average earning a gross revenue of Rs. 2,724 (US$42) per month (this rose by 45% to Rs. 3,951 or US$61 per month by mid 2015)1. Some of the growth can be attributed to the government’s financial inclusion drive — the Pradhan Mantri Jan-Dhan Yojana (PMJDY) — which directed banks to push transactions through agents. As a result, the fiscal year to March 2015 saw a 45% rise in the number of transactions at agents to 477 million and a 64% increase in the value of transactions at agents to Rs. 859.8 billion (US $13.2 billion). As the government extends digitalisation of its direct benefit transfer schemes — building on the success of “Pahal”, the programme for liquid petroleum gas subsidies — we can expect this growth to further accelerate. But it will have to accelerate fast if the agent network is not to face further churn and dormancy. Our April/May 2015 survey revealed that 72% of agents started this business less than 18 months ago. Further, at an aggregate level, the proportion of dissatisfied Bank Mitras is almost double (46.1%) of those who are satisfied (23.4%). 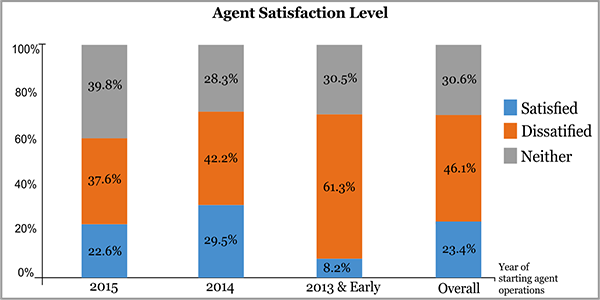 A closer look at the data shows that a higher proportion of agents, who have been appointed recently (fiscal year to March 2015), belong to the “undecided” category (who are neither satisfied nor dissatisfied), while others who have spent one year or more are mostly dissatisfied. Previous MicroSave studies ANA 2015 India survey found that 52% of agents report monthly profits below US$18 and 44% report profits below US$11. Clearly, there is a long way to go to address this problem. The government needs to use the potential that its direct benefit transfer schemes offer to significantly increase the agents’ income on a priority basis. MicroSave analysis shows that it can afford to do so. But it cannot afford to see further churn and dormancy in the rural agent networks that are expected to provide the backbone for the nation’s financial inclusion programme. Low agent profitability is not solely due to the low levels of transactions performed by agents in India, but also because of their high operational expenditure (opex). Part of the high opex seems to be driven by high liquidity management costs, indicating that Indian agents have to travel much further to rebalance than agents in other countries MicroSave has studied. Perhaps as a function of the 2011 Swabhimaan scheme, many agents are in relatively remote villages. This means that they have to travel a median of 6.6 km (journeys taking a median of 26 minutes, nearly twice that of agents in Uganda and Tanzania; and nearly three times that of agents in Kenya) to rebalance. 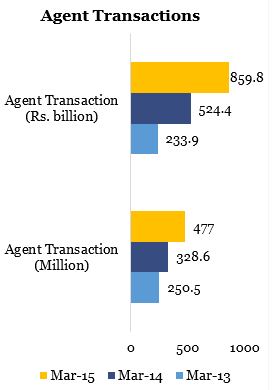 In Pakistan and Bangladesh, a small section of agents have to travel to rebalance; instead agent network managers deliver liquidity to agents’ outlets. Furthermore, Indian agents travel an average of 16 times/month to rebalance. 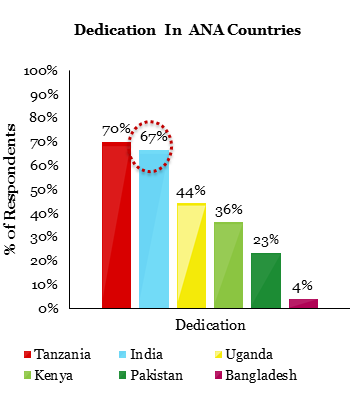 This is more frequent than in any other ANA country (compared to Kenya: 8 times, Tanzania: 6 times and Uganda: 10 times). This may be because Indian banks require their agents to report to branches regularly. Additionally, more (67%) Indian agents are dedicated to solely performing financial transactions than most other countries. These agents have no other source of income or business over which to spread fixed and semi-variable costs. This is in contrast to what is perhaps expected by RBI and other architects of India’s digital financial infrastructure, who have typically talked about agents operating out of local stores, thus spreading their opex costs across a range of businesses. The ANA 2015 India survey showed that only 35% of agents in metro areas were dedicated and thus offering only financial services. Conversely, 70% of rural agents were trying to earn a living from just offering agent banking services. This will remain a challenge while G2P commissions are low and the PMJDY financial inclusion drive remains in start-up mode. Introduction of the JanSuraksha, mass market insurance programme, may help drive some transaction volume, but, until savings account holders start to use the facilities regularly, decent profits will remain a distant dream for these agents. A part of the solution will rest in involving agents in loan origination and collection, something that we highlighted in “Great Business for Banks – So Why Are They Slow To Build Agency Banking?”. Another key component could be through Payments Banks offering creative savings productsappropriately tailored for the mass market — and sold and/or serviced through these agents. The road to financial inclusion in India has been tortuous, fraught and replete with pot holes, but the early signs of more positive future are coming into sight. Let’s hope that the government continues to create an enabling regulatory and policy environment to nurture the green shoots that are emerging. 1Source MicroSave Surveys of Bank Mitra agents conducted for the Department of Financial Services in September/October 2014 and April/May 2015.